Doc Brooks continued his torrid hitting. Falmouth Commodore outfielder Doc Brooks continued his torrid attack on Cape League pitching this week, clubbing his league-leading fourth home run -- a grand slam -- Monday night at Whitehouse Field in Harwich. In leading the Commodores over East Division first place Harwich, Brooks also maintained his league-leading slugging average of .714 and helped Falmouth stay atop the West Division at 8-3. As of Monday, June 26, Brooks also led the league in runs scored with 13, extra base hits with 8 and was third in on-base percentage. By the beginning of this week, however, Brooks wasn't the only Commodore sailing along with the league's top sluggers. Fellow Commodore Luke Scott, a lefthanded hitting outfielder from Oklahoma State was a close second behind Brooks, with three dingers to date. A night earlier on Sunday, though, it was coach John Schiffner's Chatham A's who handed the Commodores their walking papers. Down by a pair, South Carolina's Marcus McBeth clouted one off Falmouth's Justin Maureau (2-1) in the top of the fifth inning off of to stage a come-from-behind win and to help the A's to a three-way tie for first place in the East with Harwich (7-5) and Y-D (7-4). Going eight innings for the A's and for the win was Michigan junior Bobby Korecky, whose record climbed to 2-1 on the season. While Falmouth and Wareham remained tied for first place in the West Division, and as Harwich, the Y-D Red Sox and Chatham battled for bragging rights atop the East, the upstart Bourne Braves were busy opening some eyes with a trio of league-leading hitters and a confidence-boosting win at home Saturday (June 24) over Harwich. Bourne Braves' righty Khalil Ballouli, out of Texas A&M, went 3-0 Saturday after downing the Harwich Mariners in a tight, 2-1 contest at Coady Field.2-0. Bourne Braves' first baseman Jon Benick jacks one deep to right against the Hariwch Mariners last Saturday afternoon at Coady Field. Coady Field came alive early Saturday afternoon when Virginia's Jon Benick crushed a 2-1 Rob Moravek offering to deep right field, knocking in two runs and giving Braves' starter Khalid Ballouli all he'd need for his third win of the young season. Ballouli, a righty from Texas A&M, led the Cape League in wins as of Tuesday (June 26), was ranked sixth in earned run average at 0.93 and in 19 innings pitched had fanned 12 and walked just six. David Stone of Virginia and the Wareham Gatemen lays down a beauty versus the Cotuit Kettleers. Speaking of pitching, the Gatemen looked decidedly strong as the week winded down, with three of the league's top four hurlers all wearing Wareham cranberry red. Showing the way was none other than Virginia Tech southpaw Pat Pinkman, 1999's Cape League co-pitcher of the year. As of Monday (June 26), "Pink" was at 2-0 with a 0.00 earned run average and a 2/10 walk-strikeout ratio in 16 innings of work. No doubt, Pinkman again kept mesmerising Cape League baserunners with what may be the best pick-off move on the East Coast. In 1999, Pinkman set the Tech all-time record for pick-offs as just a sophomore. Following Pinkman on the Wareham hill was Rice lefthander Jonathan Gonzalez and Harvard's Big Ben Crockett. Gonzalez (0-0) sported an ERA of 0.00 in 12 innings of work, while Crockett, a 6'3 righty, was 2-0 with a 0.72 ERA in 25 innings of work and an astonishing 23 Ks to three walks given up. Leading coach Scott Pickler's Y-D Red Sox and the Cape League in hitting thus far is Cal State-Northridge's J.T. Stotts, who by Monday had slashed his way to a .424 average in 12 games played. With more than a fourth of the season already completed, Harwich Mariners' outfielder Adam Stern followed a close second behind Stotts at a .390 clip. And as Wareham continued to dominate the Cape League pitching ranks, it was a trio of Braves chopping their way to the top 10 among Cape League hitting leaders. Princeton's Max Krance, a lefthanded hitting outfielder out of South Nyack, NY, went 3-5 Sunday night at McKeon Field in Hyannis with five RBI to up his average to .383. Behind Krance, the Braves' lineup also boasted Duke' infielder J.D. Alleva (.333) as well as Cincinnati's Kevin Youkilis (.333). 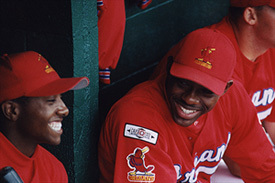 Orleans Cardinals' Michael Woods and Gary Harris share a moment of levity at Lowell Park early last week. Harwich Mariner Steve Daniel, of Tennessee, takes a hack at a Khalil Ballouli pitch at Coady Field as Harwich fell to Bourne, 2-1 last Saturday afternoon. Cape Cod Baseball League publicist extraordinaire Missy Ilg Alaimo finally made it to her summer home in Chatham last Monday and wasn't in town for long -- with four children in tow -- before she hopped right into helping out with the youth baseball clinics offered by the A's. All of the other Cape League organizations also got their youth baseball clinics underway as summer began in earnest. 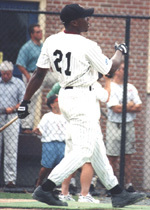 1999 Wareham Gatemen third baseman Matt Longo made his return to the Cape League late last week, but he won't be wearing the same uniform this time around. Longo, who attends Villanova and had hoped to be drafted earlier this month, returns this time around with the Cotuit Kettleers. Behind the plate and hitting the ball well for coach Mike Coutts' Kettleer defending league champs is Stephen Ghutzman, a Spring, TX native who attends Blinn Junior College. Ghutzman also happens to be the younger brother of fellow Cape Leaguer Phillip Ghutzman, a backstop this time around for the Falmouth Commodores. The elder Ghutzman also played for Blinn Junior College before catching for the Wareham Gatemen in 1999 and prior to transferring to Rice University last fall. Hyannis Mets' head coach Tom O'Connell was inducted last week into the Braintree High School Athletic Hall of Fame. Before launching into a near half-century of coaching baseball (46 years), O'Connell was one of Braintree's top athletes and later became a teacher and coach at his alma mater. Following his high school coaching days, O'Connell went on to manage the Brandeis University nine in Waltham and then to Princeton for just under 20 seasons in the sun. The Coca Cola Pitcher of the week (June 18-24) was Wareham's Pat Pinkman, followed by Coca Cola Hitter of the week, Doc Brooks (9-20, two HRs, five RBI).